This is a scaled-down version of the two Rockman (Megaman) arcade games: Rockman the Power Battle, and Rockman the Power Fighters. Hence the “Battle and Fighters” in the title there. 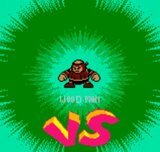 For the unaware, these games essentially pit Rockman with a bunch of Robot Masters, so you’re essentially playing the game, just without all that boring “level” stuff. 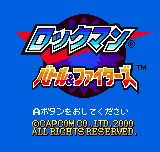 Capcom actually does a really good job of converting the games; sadly there’s only about maybe three total tunes here in the NGPC version, and the characters look amazingly 8-bit. The backgrounds look super sweet though. Oh, and why the hell is Power Fighters so damn easy? Like, right in the middle of every battle, Rush or Beat or somebody else comes along and makes you invincible, or kills the enemy for you, or something. I never could understand what the hell was with that. Basically all you’re going to get here is the Options menu and the names of the Robot Masters. Fortunately this doesn’t affect the Power Battle much, but Power Fighters has quite a bit of storyline in it, so you won’t really know what’s going on. Still, all you do is shoot people, it’s not rocket science or anything.